The neighbourhood may well be cementing – or re-cementing – its status as a leftie hotbed lately with the opening of Firebox, an events space and café run by Counterfire, who describe themselves as a group of revolutionary socialists. 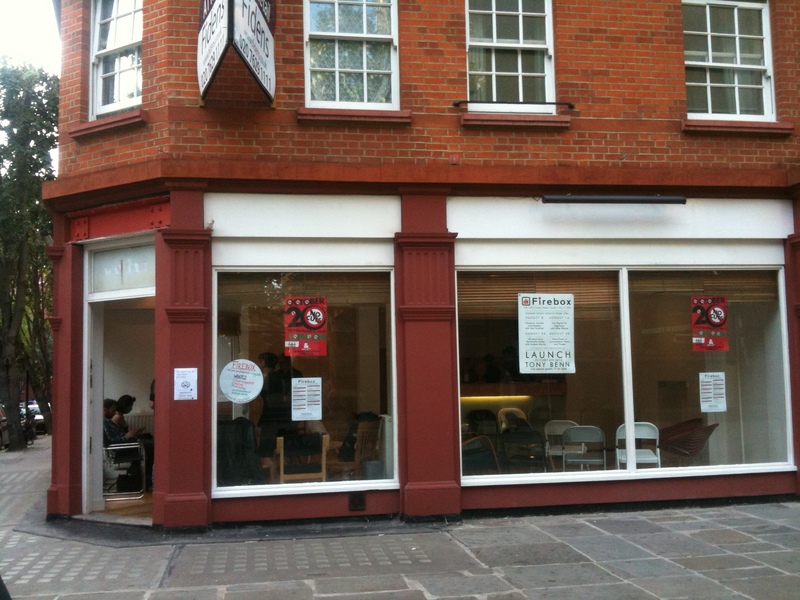 Opening tentatively a couple of months ago in one of the many vacant shops in Cromer Street, WC1, the centre plans to have a big red opening on Friday 6 October with special guest Tony Benn. 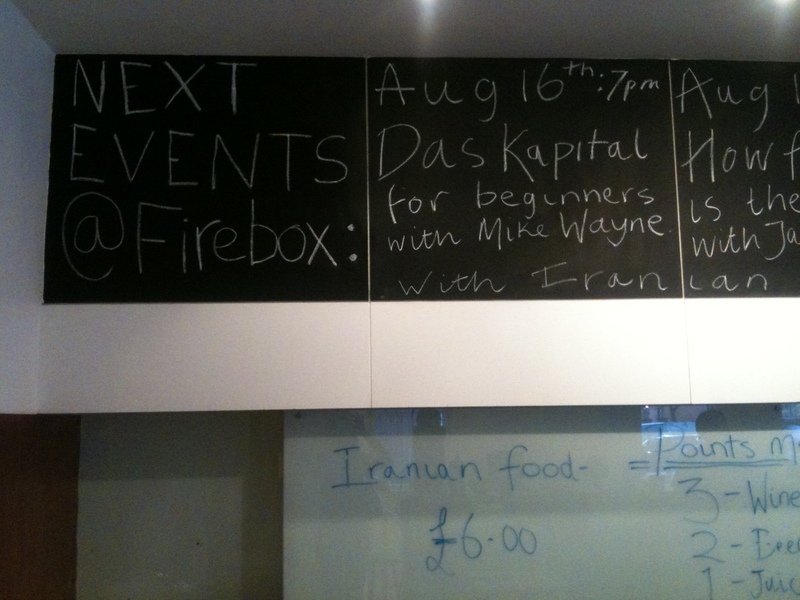 Firebox is already running a busy calendar of events, with talks on the likes of imperialism and the Arab Spring (with Tariq Ali, no less) and post-capitalist economics. At the less heavy end of the scale, there’s an all-day clothes swap coming up. 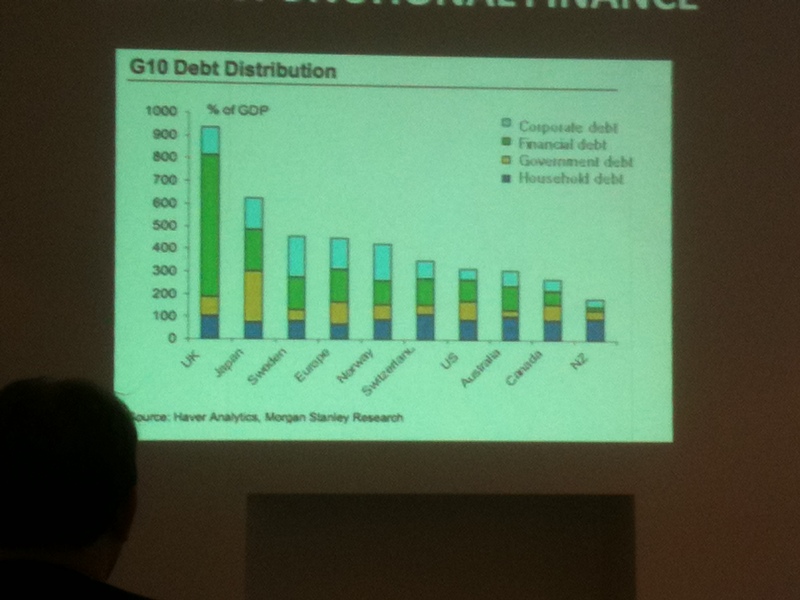 I checked out the irresistibly entitled “How fucked is the economy?” talk a couple of Fridays ago at Firebox. A fiver got me in the door and a glass of wine, although at first there was some confusion at both the door, and the charmingly battered copper (no word play intended, honestly) bar as to whether I was to get one or not, and how much extra it was for the tempting Iranian food. Thankfully a woman in an immaculate 1920s bob and outfit of the same vintage (all black, of course), stepped in to clarify. Although there’s probably a nod to some sort of non-hierarchical anarchist governing structure, in the end someone’s got to be in charge, and this was she. Clare Solomon, the centre’s lead co-ordinator, explained how the centre came to be here. This is no pop-up or squat. “We’ve taken a lease,” she said, adding that Cromer Street wasn’t cheap, despite all the empty shops. “This area’s great, we’re near the unions here, close to Camden Town Hall, and I lived around here for 20 years,” said Solomon, a former president of the University of London Union. Solomon said Firebox has gotten off the ground from donations, both in-kind and cash from various organisations and charities, with revenue from events and the café to pay the rent. What followed was a whirlwind of graphs, some mind-numbing, some quite mind-blowing. Meadway’s take-home message was that austerity isn’t working, and here were the diagrams to show a directly link with the double-dip recession. “Cuts are paying for this bit here,” said Meadway, waving a laser pointer at the relatively modest yellow bit in the chart below. But crikey, take a look at the green bit! We’re doomed. After that I needed a drink, although that got me to thinking about coffee. It will be interesting to see if the space can flourish as a café, the immediate area could certainly do with it, and having it with a dose of thinking will be a good thing too. Solomon said that Firebox drew inspiration from the Partisan Café, a leftie bolthole in Soho, which existed for a brief period in the 1950s. In turn Partisan was inspired by coffeehouses in central Europe and London’s discursive café scene of the 17th century: “For centuries people have been meeting in coffee shops to organise,” she pointed out. Long may the tradition continue. This entry was posted in Arts and Entertainment, Community groups, Current Affairs. Bookmark the permalink.